In the foothills of Himalayas, in the lap of India’s oldest National Park (Jim Corbett National Park) lies the IIM in the North, IIM Kashipur. Kashipur literally translates into “The Abode of the Shiva”, a city which has been named after Lord Shiva. This journey started when I got a mail from IIM Kashipur and the words “Congratulations you are selected” flashed on my screen. 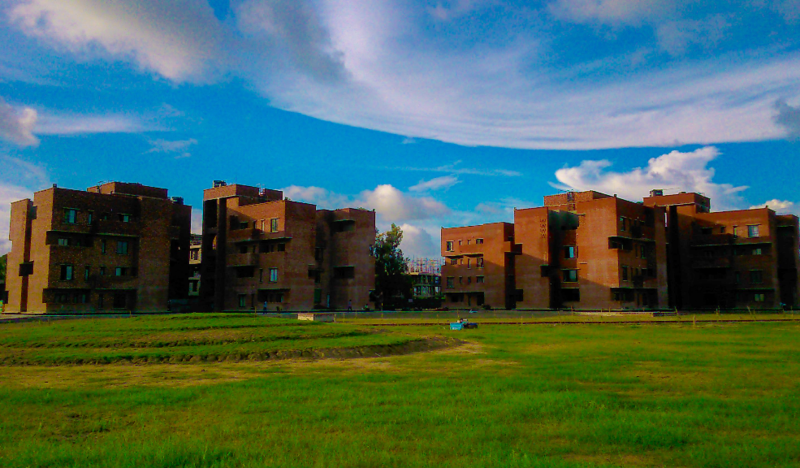 On the firsthand research, it was quite evident that IIM Kashipur was clearly different from all the new IIMs. It was the first one among all the new IIMs to move to its permanent campus. Unlike other new IIMs of the country, IIM Kashipur is established in a rural underdeveloped location and hence this offers us a chance to see real India through our own lens. It was established not only to raise future managers but also to develop the surrounding region as a whole. The professors and the guest lecturers often emphasize and motivate us to venture into social entrepreneurship. A typical day in IIM Kashipur starts with we hearing banging sounds on our doors as our flatmates are there to wake us up after 3 hours of sleep. The first thing Kashipur has taught me is that daunting, strenuous and complex tasks become way easier when we do them in a team. You can not expect to survive the rigour of a B-school until and unless you are ready to work with a team. The epiphany moment when we realise our worth and efficiency is increased much more after going through the arduous and sleep depriving induction is experienced by all those who survive the induction. In induction, we are provided with a glance at what life ahead for two years is going to be. All the clubs and committees give us an assignment with deadlines of a few hours and the next day the best performers are awarded PPIs (means they get a chance to be directly interviewed by club/committee without going to GD/PIs and other rounds.) and those who fail to meet the deadlines are properly scolded. The induction journey starts with an anger towards the seniors because of the sleep deprivation and small deadlines enforced upon us but by the end, it forms an unbreakable bond and metamorphose us into something which we could not even have fathomed of a few days back. The final phase of the induction occurs in Jim Corbett National Park (India’s Oldest National Park). Corbett park is the home to a large number of animals like tiger, elephant, deer etc. When we entered the hotel booked for our training we had a chat with the vice president of the hotel. He called us “The Cubs of the Corbett”. That moment I realised that the next two years of my life in this land of ethereal beauty would be one of the most memorable phases of my life. In the outdoor induction in a resort inside Corbett National Park, we performed many group tasks and in those two days again we had a lot of learning, fun and introspection. The coursework is based on case studies published by the top reputed premier b schools of the world like Harvard, MIT, Yale etc. In classroom discussions with peers hailing from different education backgrounds such as engineering, sciences, law, commerce, agriculture, management etc. such solutions come out which are a medley of experiences from diverse backgrounds and on the top of that people with work experience take these discussions to fruitful solutions. It doesn’t take much time to realise the importance and worth of case discussions. Another important thing that I realised after getting into IIM Kashipur is that professors are gods whom we must listen with utmost concentration. They transform such seemingly difficult and abstruse topics into something very easy to comprehend. The assignments, surprise quizzes, classroom interactions and live projects with professors uplift both our skills and problem-solving abilities. With 13 Bloomberg Terminals, a library having a large of books and subscription to a large array of journals, magazines, newspapers etc. one finds a large pool of knowledge at his disposal. Hostel buildings in Kashipur were built recently. So they are in excellent conditions with all the basic amenities like washing machine, microwave oven, water purifier and refrigerator present in each floor of each hostel block. IIM Kashipur in association with World Bank also provides come environment and agriculture-related courses. So we lay a lot emphasis on preserving the environment. There is a radiant cooling system instead of ACs in the hostel. It is effective and never let you feel the ambience outside of the walls and at the same time promotes environmental conservation. A large quantum of events occurs in the campus all around the year with students participating from the top B-Schools across the country. Each event has its own significance but that event which steals the show is Agnitraya. It lasts for three days with a plethora of events related to academic, cultural and sports domain and also every year a countrywide famous celebrity commences the event. It wouldn’t be an exaggeration to say that IIM Kashipur has exceeded my expectations by a very big margin. I sincerely hope that for the next two years I would be able to make the best out of this great institution and someday be able to reach great heights on the shoulder of this institution & the skill and knowledge it will provide. I would like to join Aditya Birla Capital Limited. It is one of the largest private financial player in India. It provides a large range of services both for retail and corporate customers. I took CAT because I specifically wanted to join one of India’s top most financial firm. In my graduation days, I came across a few subjects like Financial Accounting, Cost Accounting etc. This is when an interest in Finance sparked up inside me and my life suddenly found a new goal. ABG was one of the few dream companies that I wanted to work on with when I decided to do MBA. I am looking forward to pick up Finance as my specialisation in the second year. Now it looks like as if life has given me a chance to turn this dream of mine into reality.